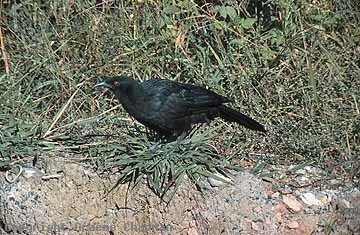 White-winged Choughs are distant relatives of the birds of paradise, adapted for living in the dry forests of eastern Australia. 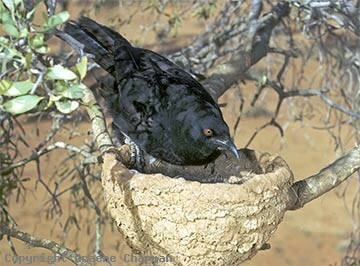 A close relative is the Apostlebird and both these species belong in the family Corcoracidae, the mud nesters on account of their habit of building nests largely of mud. Very sociable, they also both occur in family groups, quite large at times, even up to a dozen or so although group size in choughs usually averages about five. 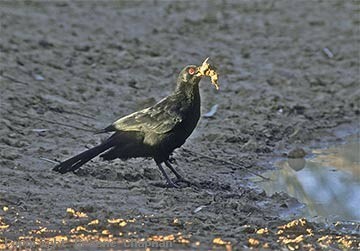 White-winged Choughs are litter feeders and move in a scattered group across a broad front, but rush quickly to join a bird that has discovered some choice morsel. Their long curved bill is ideally adapted to probing the litter and sweeping it away with a quick sideways flick, and digging.They maintain a regular dust-bathing site, usually a sunny patch of dry bare ground where they dig little tracks into the earth to obtain dust for feather maintenance. Most of the birds in a group help to build the nest, "help" being the key word, very much a learnt activity. The two adults do most of the building and it is sometimes funny to see a "helper" stand on a newly added section of wet mud, and cause it to collapse! Nests tend to be located in much the same place year after year or in some cases old ones are refurbished especially in a dry period when there is little or no mud. Incubating the eggs and feeding the nestlings is also a shared activity, but again, the two adults do the lion's share. 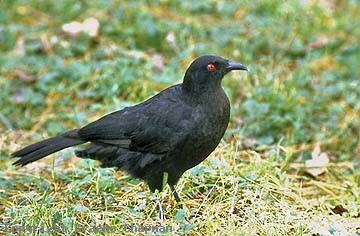 693001 ... White-winged Chough, adult with red eyes. 693201 ... Immature (brown-eyed) helper about to sit on eggs. 693202 ... Collecting mud etc for nest material.